Don’t Set Limitations For Yourself. It’s funny how people can limit themselves by what they put in their mind. A comment made me think of this and it brought me back around to one of the people in my life that never let anything limit them from what they wanted to do. My Grandpa Hagood. Diagnosed with Diabetes, he still worked until he reached retirement. Even when his leg had to be amputated from just below the knee down, he didn’t let it stop him from living life. In fact, he made quite a few people uneasy when he climbed a ladder to fix a few shingles just a few days after being released from said amputation. He got his prosthetic leg and kept on walking. Even after he had to have first his big toe, then all his toes on the other foot amputated… he kept on walking, because he had things to do and people to see. He wanted to live life. Then he was diagnosed with Congestive Heart Failure – at that time, it was a 3-5 years life expectancy. I don’t remember the exact timeline of when he was diagnosed with CHF, but I remember being pregnant with Alyssa and wondering if he would get to meet her because those 3-5 years were near. I especially wondered when he was still driving a car even after they took his license away. I guess he had things to do and the car keys were calling his name. And it did come that close. 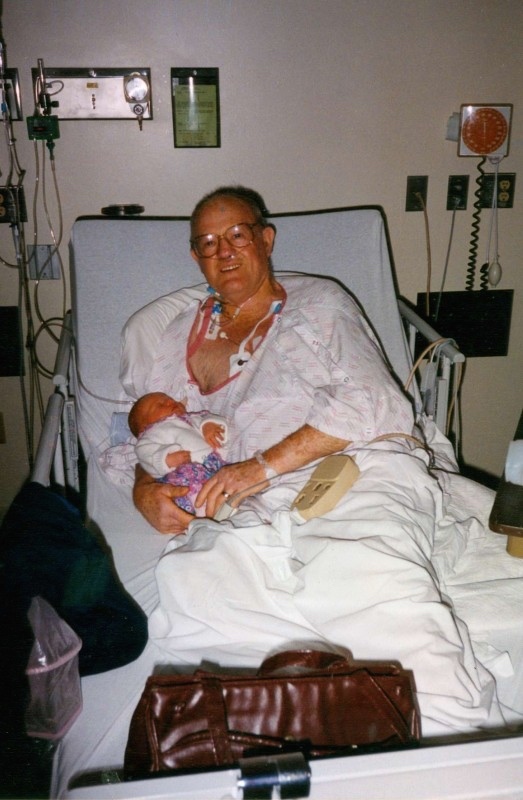 The picture of my Grandpa in the hospital bed, not a new story… he went in with a heart attack on 4th floor of the hospital and I went into labor and delivery on the 3rd floor of the same hospital. He wanted to come down, but being in ICU, that was not allowed, nor was bringing Alyssa to meet him. But, as you can see by the picture… it happened. Alyssa and I were released home and I got a call from a nice nurse – my Grandpa was going to die, expected in less than 24 hours, how soon can I bring the baby up for his last wish? Within 2 hours, my mom and I went to introduce the two. It was a sobering visit and one that I won’t forget. 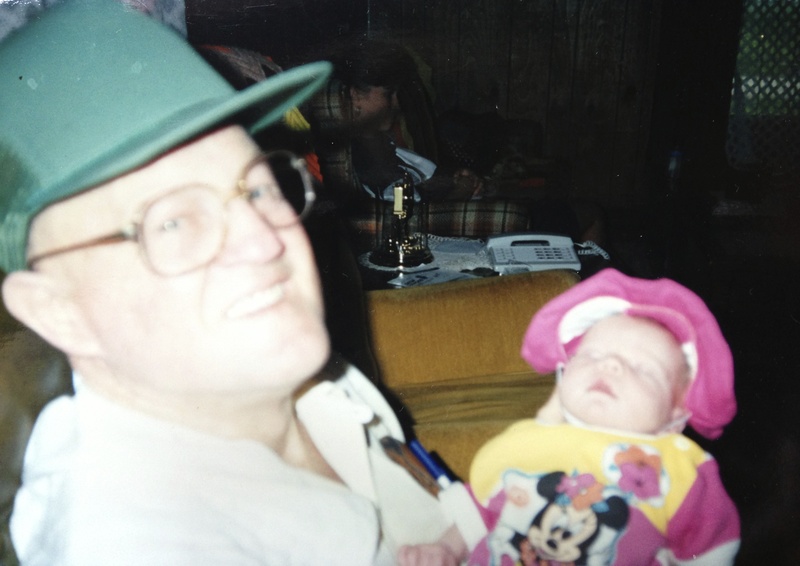 If you look to the picture of him in the green hat….that was a few weeks later. That yearning for life, the love and anticipation for watching that little bundle grow, turned his health around. We waited for a call of expiration that evening, but instead we got a call that he would be released in a few days. He had other plans, just like after the amputations… he did what he wanted to do. And he wanted to hold that baby some more. Any medical condition that you have, don’t give in and be it’s victim. Take charge and show IT what your life will be like! Determination, motivation, belief, love, and a zest for living life to the fullest are all yours. It is up to you to choose whether you are a victim or whether you are going to be a survivor. I am not going to succumb to any illness or medical affliction and miss out on my life. 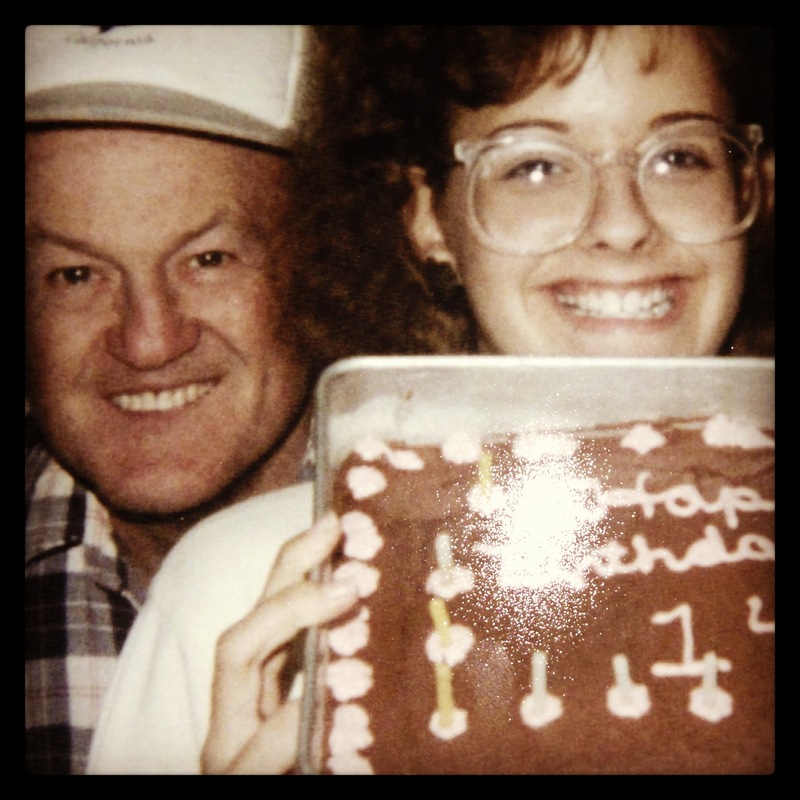 My Grandpa had an artificial leg in the picture of me with the cake – still photobombing. Now, look at read my blogs, look at my social media updates… what do you think? You would be surprised at what you can’t see in a profile picture. There are days I am tired, don’t feel good, am mad, or sad or blue. Everyone has those days! You better believe that I won’t be sulking, I am here to live and live I shall!! Who’s with me?? My Mother is planning with her two brothers to clean out my Grandmother’s house. She asked me if I wanted anything out of the house. I had to stop and think, I couldn’t think of anything tangible that I would want from her house. As I tried to think, I remembered way back to my childhood days. I lived only 6 miles away from them and our house was on the way to their church. They stopped by after church every Sunday morning and before and after church every Wednesday and Sunday evening. While these visits did get tedious at times, when we had other company, etc. I am really thankful that they did that. I know not everyone is blessed with grandparents or to live in such close proximity, like I was. Sunday after the morning service I would often get to go spend the afternoon with Grandma and Grandpa, since they could just drop me back off at home on their way to the evening service. 🙂 Every Sunday for lunch, rain, shine, snow, hail – it didn’t matter, it was burgers on the grill for lunch. If it was nice outside, I would play on the big wheel whilst Grandpa cooked. We always, always, had fruit after lunch/dinner. When I played outside after lunch, I loved the playhouse in their back yard. Since I was an only child, sometimes my cousins on my Dad’s side of the family would come down and we would play drive through or house. When they didn’t come down, I would play wiffle ball in the back yard with Grandpa pitching me the ball and every once in a while Grandma would. Occasionally, Grandpa would drive over to the Wedge in Illiopolis for an ice cream cone. Grandma and Grandpa would often take care of me when I was sick as a child so my mom could go to work. They took me to the doctor a time or two. What item in the house could possibly hold meaning to me? 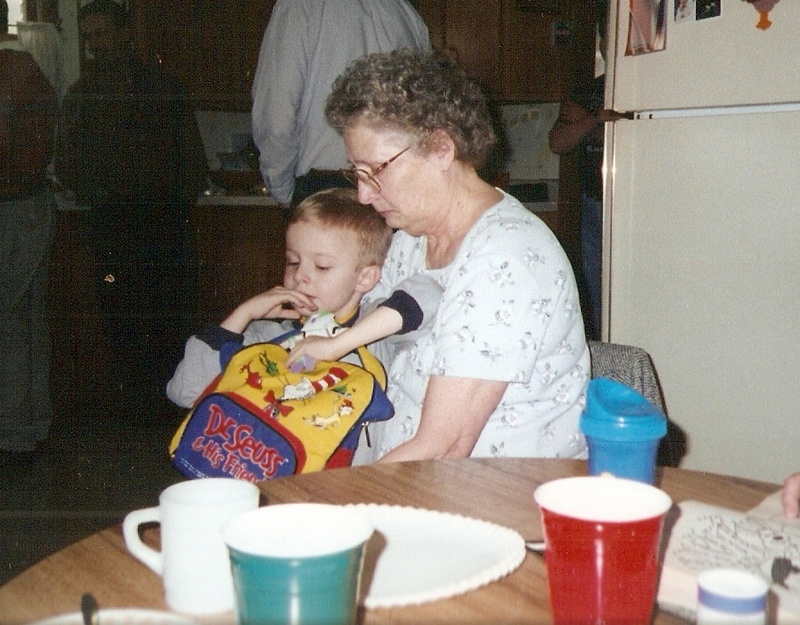 That was when I told my Mom if the coin purses are still around there, I would like to have one of them. Not because it is tied to money, but because I can visualize the coin purse perfectly. I think they always carried the same one. I guess I will find out if it has withstood the test of time, or if it has dissolved into a pile of dust. My Grandfather mentioned above has been the subject of several of my posts about miracles. He passed away over 16 years ago, but it seems like just last year. In reality, my Grandmother has declined over the past year with osteopenia and dementia. After several instances of extreme confusion – once she was pulled over in a Kroger parking lot. The police officer was so concerned about her mental state that he had my uncle come pick her up. At Christmas she was her usual self, being less stubborn about using a cane but still as stubborn as a mule on using a walker. She had been so stubborn on both of those subjects for two years that she had a severe lean to one side and her balance while walking suffered. Every family talks about nursing homes, but at Christmas time, it was painfully obvious that the time was very near. She was becoming unable to care for herself due to Alzheimer’s Disease. Medicine was a huge concern – was she taking enough, was she taking it at all? Some of the vertigo issues could have been caused by an overdose on one of the meds. A few days later is when that day came. Less than a few days after Christmas, my uncle took her to the hospital as she had fallen down four times before noon. There was no real reason medically for the falling but the confusion and off the wall conversations were happening all the time. She went to a nursing home from the hospital. While it is certainly in her best interests, it is still a sad state of affairs. I guess because it is change and a change that forces you to face the reality of the situation. The house will be empty or filled with a new family, but it won’t be Grandma and Grandpa’s house any more. Life is all about change, isn’t it? I remember how excited pennies made me as a kid… as an adult, we may not even pick a penny up off the street. 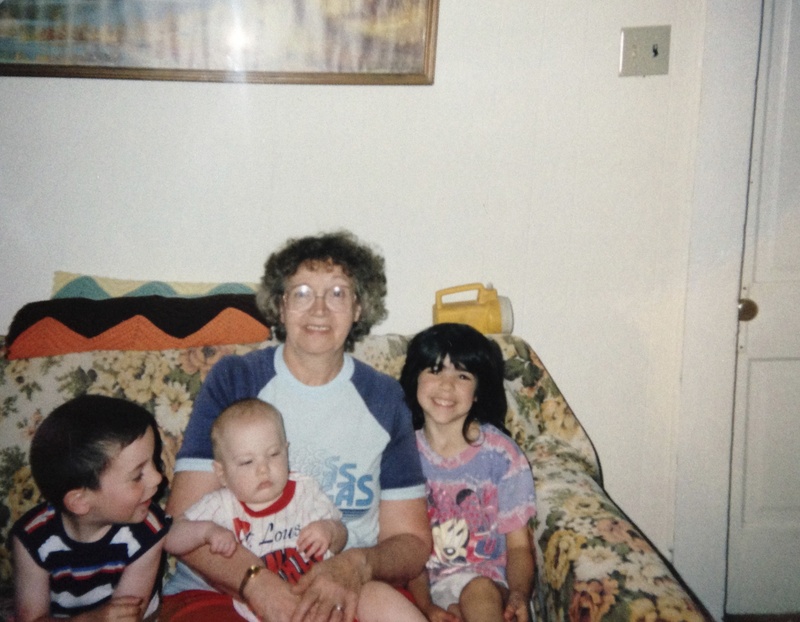 I hope that I am around my grandchildren enough to give them memories like I have of my grandparents. And I hope that they always have memories to remember me. Have You Witnessed a Miracle? It was August 1993, that I myself witnessed a miracle. Something so truly amazing that it could only be from the hands of God. Before I tell you the details, let me give you a little history. My grandfather was a diabetic on insulin, had his leg amputated from the knee down on one side and his toes removed on the other foot due to circulation issues. He had a heart attack and was later diagnosed with Congestive Heart Failure. Keep in mind that today, patients with CHF can live for a long time as many more treatment options are available. Eighteen years ago, however, it was limited and the longest anyone expected these patients to live was at most 5 years. However, most succumbed to the disease between 2-3 years. It was mid-high school that my grandpa was diagnosed with CHF. He lived less than 10 minutes from my house for my entire upbringing and my paternal grandfather passed away when I was 6, so I have many, many memories of him. Since they lived so close, and were retired, they took care of me when I was sick or the baby sitter was not available so that my mom could go to work. Great memories of pancakes for breakfast, playing in the playhouse and going to Dairy Queen for a full meal deal. They always had one of the free dessert coins to give to me. I loved those things! Oh, and they always had a few pennies for my piggy bank. Pennies don’t mean a whole lot now, but to a kid, they are a treasure! About 6 months after I graduated high school, I was engaged and found out I was pregnant. My grandpa was kind of excited to be a great grandpa! During my pregnancy, his health declined and he was in and out of the hospital. On a Saturday in August, the 7th to be exact, my mom called me and told me he had a heart attack and was in the intensive care unit at the hospital. I remember rushing to see him that evening and he didn’t look well at all, his kidneys were failing, his diabetes was difficult to control. I remember seeing him suffer, losing his strength and praying to God to not let him suffer long. I had planned to come and see him the next day, but my daughter had other plans. I was due August 16th and she didn’t want to wait. Late morning August 8th, I went into labor. While my grandpa was on the 4th floor in ICU, I was admitted on the 3rd floor labor and delivery. Alyssa was born at 11:26 p.m. on August 8, 1993. One of the happiest days of my life and yet a bittersweet one as well because I knew how much my grandpa wanted to be there to see Alyssa. But in the ICU, babies couldn’t visit and he couldn’t leave ICU. We went home a few days later and I remember getting a call from the ICU nurse just shortly after arriving at home. She told me that my grandpa was not expected to live much longer and as a last wish, he told the cardiologist, Dr. Kola, he would like to see his first great grand baby. Dr. Kola ordered the ICU nurses to quarantine the ICU and sanitize it so that I could bring Alyssa in and they were ready. (This directive showing compassion and sympathy from a doctor could be considered a miracle all in itself, but that was just the beginning.) I was a brand new mom and upset, so I called my mom – after all, it was her father and I knew she would want to be there as well. She came and picked Alyssa and I up and drove us to the hospital. We arrived and I was amazed at how many tubes and wires he had on and in him. But his face really lit up when he saw Alyssa. We put her in his arms and took pictures, he kissed her and when we left, we said our goodbyes. I went home and cuddled with my bundle of joy, as she really helped me through that tough time while I waited for the call to advise that he had passed away. It was after 10:00 p.m. when the phone call came from my mom. Dr. Kola had personally called my grandma to tell her that he witnessed the most amazing thing he had ever seen. Since my grandpa held Alyssa, they had been pulling the wires and tubes away from him, he no longer needed them. His kidneys started working again. His diabetes was controlled. He was going to come home, and he did. We were blessed that he was able to hold her many times after that day. I truly believe that everything happens for a reason. I wasn’t really supposed to get pregnant when I did, I wasn’t married yet, but if I didn’t have that bundle to bring my grandfather such joy I would have lost him that day. And I also truly believe that a positive attitude is the best medicine. He lived to see my Alyssa grow up and was feeling pretty good until Alyssa was about 2 years old. His health then started to decline again. A few months after her 2nd birthday, I found out I was pregnant again due August 2nd, 1996. His health continued to decline but bounced back a little bit after I found out at 4 months along that we were going to have a boy. My grandpa was even more excited to have a great grandson he would have one of each! There were several hospital stays as my grandpa got worse with his CHF. He went into the ICU again on July 30th, my Grandma’s birthday. About 9:30 p.m. on July 30th my water broke, more so, it gushed everywhere. Brian tried to be born on my Grandma’s birthday, but missed it by a few hours, July 31st at 3:55 a.m. Again, Grandpa was on 4th floor in ICU and I was admitted on the 3rd floor – I had a feeling of de ja vu. This time, when he heard about Brian’s birth, he started to turn around and he was moved out of ICU, which meant we could go visit. He got to see Brian and hold him, but his health did not make the remarkable recovery and sustain it as he did with Alyssa. He got to come home, but this time, his health failed much more so than it had in the past. 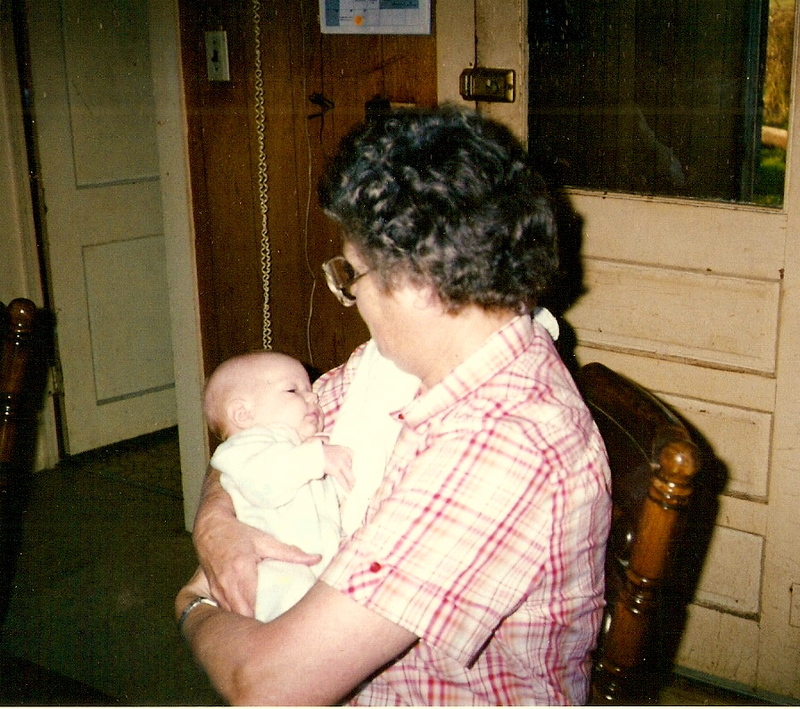 When Brian was 4 months old, I remember seeing my grandpa suffer, losing his strength, losing his ability to get around. Knowing how independent he had always been, I knew that this was a hard time for him. This man climbed on the roof to fix a shingle as soon as he was released from the hospital from having his leg amputated. I prayed that God would relieve his suffering. This time God didn’t relieve his suffering by removing it, this time, it was to bring him Home. I will never forget, the whole family surrounded his bed in the hospital room, he had severe edema and was not alert. Dr. Kola even came and sat with the family for a little bit. When we went to leave, as we always did, we went to tell Great Grandpa bye and Alyssa, as she always did, gave him a hug. 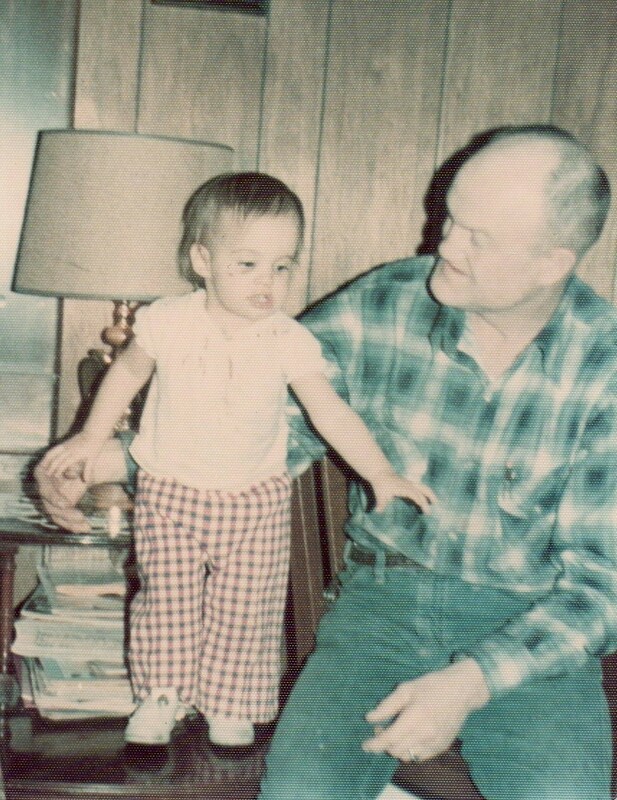 She looked at my mom and I and in a sad little 3-year-old voice and said, “Oh, he didn’t say goodbye.” I know in my heart that my grandpa heard that and knew he couldn’t ward off death forever. It was later that night that God took away his pain and brought him to heaven. My mom called to give me the news as my husband was preparing to leave for his 3rd shift job at 10:30 p.m. It was a flood of emotions from tears to sadness that he passed to extreme relief that he no longer suffered. He was a blessing in my life, teaching me the importance of family relationships, to always keep going, to work hard, to always look for the good and basically to enjoy life regardless. A year later on the same date that he went Home, at 8:30 p.m. I put Brian down for bed in his crib. At 9:00 p.m. he was sleeping soundly. I know my grandpa felt the pain in my heart as 10:30 p.m. rolled around and I started to remember the previous year. I know this because at 10:30 p.m. Brian started laughing hysterically, as if someone was tickling him. I ran in his room and he was standing at the crib rails with his hands reached out in front of him and having a good time. I know that my Grandpa was tickling him to tell me not to be sad for him. I picked Brian up and felt the love he just shared with his Great Grandpa. I put Brian back down to sleep and went to bed myself knowing my Grandpa was still part of my children’s lives. So, I have had prayers answered in ways that I did not expect. God gives us the answers we ask for sometimes, sometimes He does not answer them at all and sometimes He answers them in ways we least expect so that we know He listens to our hearts. The first time God answered, he relieved his suffering by making him better. Which was a true blessing to have him part of my daughter’s life and the first few months of my son’s life. Not many people can say that they knew their great grandparents, but mine can. They knew 3 out of the 4 great grandparents and still have their Great Grandma H. God blessed my life in many ways, but truly by witnessing a miracle. A miracle that I am truly thankful for, because of it, my children met their great grandpa. My grandparents were each such a blessing in my life and I am so thankful that they were able to be a blessing in my children’s lives. My Grandma B lived until just this past December, so she was part of their lives through their teen years. My Grandma H is still part of their lives and continued to host holiday dinners and lunches when family is in town until 2012. In 2012 she began falling and the day after Christmas that year she fell several times in one day. Her Alzheimer’s Disease started taking over and stopped her from doing regular daily tasks, like taking her medicines. From that day forward, she was in a nursing home. 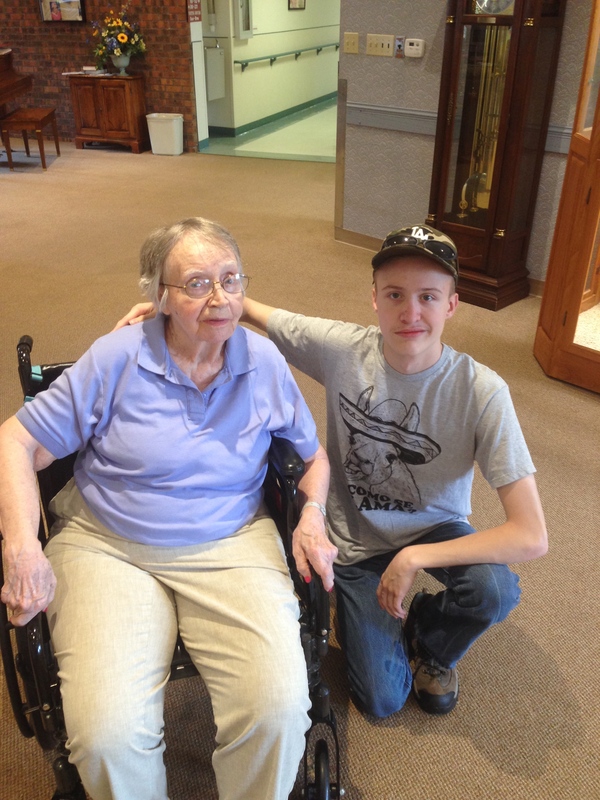 As of today, May 25, 2015, she is still in the nursing home and continues to decline in cognitive ability. But both my kids had many good years before that happened. The ongoing instilling of the value of the roles that your family plays in your life. I hope that you get prayers answered in ways that completely change your life, as they have mine.